Apple’s iOS App Store was released just over 6 years ago in July of 2008. When it was first launched, the concept was simple. Developers made an app, and the app was placed on the App Store. They put time and effort into creating a unique experience, and charged for it accordingly. Some of the original games were $3-5, and they were still successful. How would those apps perform in today’s market? Now, most developers simply try to cash in. When Flappy Bird exploded in February of 2014, it spawned dozens of clones. They were all free and featured ads or in-app purchases for lives. The freemium term refers to selling an app for free, then charging money for currency within the game. This can either help you progress faster or play longer. Think of it like an arcade machine. You can walk up to it and check it out for free but if you want to play a round of Mortal Kombat for example, you need to put in ¢25. If you lose the fight, you put in more money. After a few hours of playing, you’ve spent enough money where you could have bought the game. This is the premise that developers are hoping to achieve with their freemium apps. If you come in for free, maybe you’ll be enticed to spend $5, $10, or even up to $50 on in-game currency. Games are now being designed around this concept. They offer small introductory experiences for free and then spam the user with ads or limits. The point where you are blocked off is called a paywall, where you need to pay to continue playing. We Rule, which was introduced in 2010, was one of the first major iOS games to utilize the concept of time-based in app purchases. Each building that was being constructed had a time associated with it. Mojo could be purchased that would speed up this process. All games use this concept now, severely slowing progress by making the user wait unless money is spent. The problem with freemium is that it’s led to poor app quality in the hopes to make quick impulse purchases by a few consumers. Advertising companies rush to get multiple products on the market just to make money. While this revenue model sounds good on paper to corporations, it breaks down the experience that true gamers are looking for. This can’t be said for everyone though, as there are still developers who feel that a premium experience is needed and continue to make successful games. Battleheart Legacy is the most recent example. It’s priced at $4.99, but features no in-app purchases. This game has been featured by many sites, including us, for delivering an excellent product. These kinds of apps still exist and can exist because the market needs it. I personally feel that if a game is free, I value it as a free product. I expect a small experience and stop when the paywall is reached. If in-game tickets or coins are required to continue playing or progress faster, I will choose to wait instead of pay. The only time I’ve made an in-app purchase for currency is We Rule back in 2010 since I had some extra App Store credit available. Many games have come and gone since then without making any in-app purchases. The problem with this concept is that it devalues the product. If a game is priced as free, you develop the mindset of having that type of experience. The most recent example would be Rival Knights by Gameloft. This game is a fun jousting simulator that uses the freemium model. It can be downloaded at no charge and uses ‘royal seals’ for each round. Once the seals are used up, you must wait until they’re replenished or use in-game currency to refill them. I’ve enjoyed playing this game, and it died off after about a week. When the seals became depleted, I simply closed the app and did something else for a few hours until they filled up again. I’ve now had the ability to enjoy this game for a week without paying any money or viewing any ads. If they had released the game at $0.99 and removed the seals, I would have purchased it and possibly played it longer. 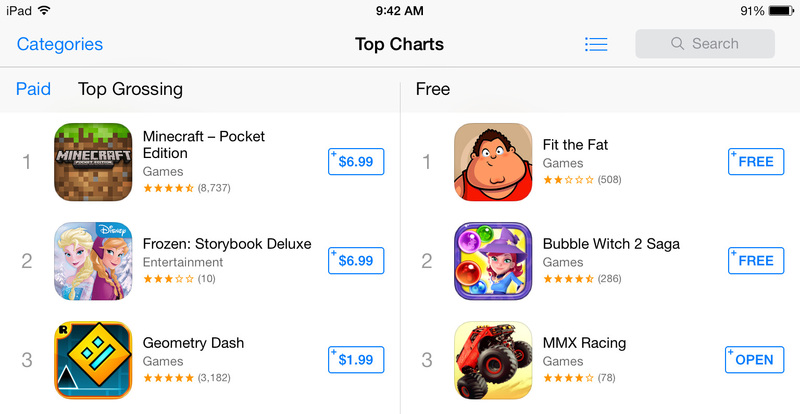 On the other side, free apps have allowed more people to try out a game before they make their purchase. Since there’s no demo period on Apple’s platform, it’s hard to gauge whether you’ll enjoy an app to warrant spending money on it. I’ve purchased apps and found out after that it wasn’t what I was looking for or simply didn’t enjoy it. By downloading an app for free, you have the opportunity to see how it is and then pay afterwards. I appreciate this pricing structure, but it’s not the one that is implemented with freemium model. If you download an app for free, you aren’t given the option to simply purchase a full version for $1-2. You only purchase the right to advance quicker, or play more for a small extended period of time. Once those resources are used, you’re back to where you were initially with only a small amount of progress gained. If developers released apps that were free and only provided a small 5-10 minute experience, then offered the full version as an in-app purchase, I think that would be more appealing. In the end, freemium can be beneficial if implemented with the consumer in mind. Corporate advertisers looking to make quick revenue by providing poorly made apps is what ruins the market for everyone else. There is still room for quality experiences, and they’ll be the ones that set the example for new apps in the future. Vote with your wallet. Show developers that premium games can be a realistic revenue model. In the end, they have to make a living too.